Throughout the world, there are thousands of different types of grasses, but the wild grass which grows along the Frenchman River Valley Ecotour route in Saskatchewan, is quite pretty. The white plumes, or florets, dance in the afternoon sun as a soft breeze blows across the West Block of Grasslands National Park. The wild grass, along with other types of plant life across the landscape of the Frenchman River Valley, feeds the various species of wildlife which roam the area. Wild grass glowing in the late afternoon sun along the Frenchman River Valley Ecotour Route through the West Block of Grasslands National Park, Saskatchewan, Canada. 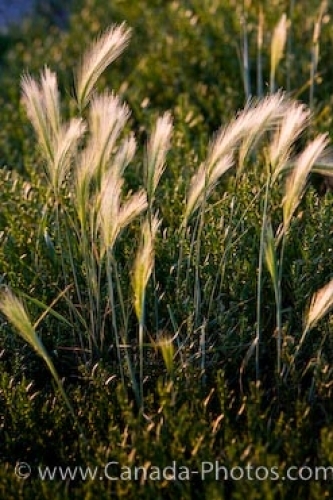 Picture of wild grass growing along the Frenchman River Valley Ecotour Route in Saskatchewan.